One of the wisest pick for the style conscious generation, the wireless earphone has the design and build quality of a much higher price tag. With Metallic Glossy finish and comfortable swappable earbuds design that attach to your ear to keep them secure – use it for work or play it balances both. With its true Wireless Technology, you can enjoy the music without any hassle or wires and you are good to jog, workout or even travel. 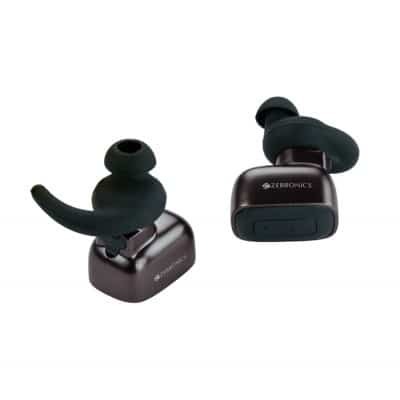 The wireless stereo earphone can be used individually too, it further comes with mic that is exclusively designed for flexibility without any chords. It can be paired two devices. With Media/call control button and LED indicator you could stay connected not just for your calls but also Music. Designed with signature Zebronics sound the earphone delivers supreme detail for all types of music. With upto 3.5 hours of battery life and passive noise reduction, the earphones bring together a solid wireless experience. With detail in every note, the product is already available with leading retail stores across India. Zebronics launches its first Wireless stereo Earphone ‘AirDuo’ 0 out of 5 based on 0 ratings. 0 user reviews.